As I write this story, I am moved to thank Bahá’u’lláh for giving me a rare opportunity never to be forgotten. I thank Bahá’u’lláh for picking me, an unworthy servant, to render a service that I shall ever cherish in my soul. Over many years, Nepal had been receiving a string of Baha’i visitors from different parts of the world. Their visits brought good developments through their inspiring talks and activities. At Nepal’s first National Convention in 1972, Hand of the Cause of God Mr. Ali Akbar Furutan represented the Universal House of Justice on that historic occasion. Other Hands of the Cause, Continental Counsellors, and many distinguished traveling teachers visited in subsequent years. We received a most remarkable and historical visit from Hand of the Cause of God Mr. Collis Featherstone of Australia and his wife Madge in 1990. This was Mr. Featherstone’s third trip to Nepal, as he had previously visited in 1977 and 1982. The Nepal Baha’i community was informed that Mr. Featherstone would be visiting the Indian Subcontinent, and his travel would include a six-day stay in Nepal. During his travels to three countries on the Subcontinent, he was scheduled to hold many meetings and address several gatherings, including a large youth conference in Lahore, Pakistan. There was a great level of excitement throughout the Baha’i community of Nepal as soon as we learned that Hand of the Cause Mr. Featherstone and Mrs. Featherstone would again be visiting Nepal. We were well aware that the Hands of the Cause of God held a unique and unparalleled rank in the Cause, and that with the passing of Shoghi Effendi; the appointment of Hands of the Cause had come to an end. We were very much excited and honored to receive such a highly esteemed guest on our soil. We were eager to listen to his talks and stories, which we were sure, would inspire, strengthen, and move us to a higher level of service. While preparing to receive him, we were busily studying the Baha’i literature available in Nepal to gain a deeper understanding of the station of the Hands of the Cause and to learn more about Mr. Featherstone. A few years earlier in 1987, the Baha’is of Nepal had sold the National Centre building located in Jyatha Tole, which was situated in the heart of the city of Kathmandu. Owing to the fast-growing business activity and dense population, coupled with the noise in the area, there was a need to look for a new property for the National Centre. Through the proceeds of the sale of that building, we bought a large piece of land in Naya Baneshwar and started construction of a new Centre in early 1990. That is to say, we did not have a functioning Baha’i Centre at that time of the visit of Mr. and Mrs. Featherstone. Most of our programs were held in Baha’i homes, such as in the home of pioneers David and Penny Walker in Kathmandu, and at the home of Bharat Koirala in Patan. On Thursday, 20 September 1990, Mr. and Mrs. Featherstone arrived at Tribhuvan Airport, Kathmandu, and were met by a delegation of Baha’i friends, including Counselor Bharat Koirala and National Secretary Penny Walker. After receiving and welcoming the Featherstones, they took them to their accommodations in the Malla Hotel. 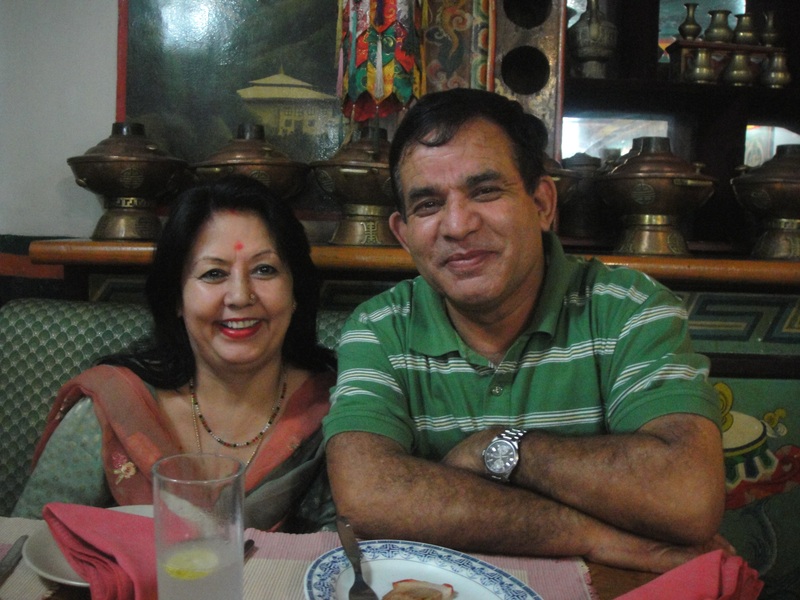 Mr. Koirala and his daughter Shabnam took Mr. and Mrs. Featherstone to see many of the major sights in Kathmandu and Patan, such as Durbar Square, Pashupathinath, and Baudhanath. Mr. Featherstone’s main program was to conduct a day-long deepening class on Saturday, the one “off day” for Nepalese, at the Walker residence. The day before when Mr. Featherstone was asked what he was choosing as the theme of the deepening session he said, “I think that Immortality of the Spirit might be good.” What a coincidence, we remarked later, that he had chosen that topic, not knowing that he would be leaving this mortal world only days later. And that deepening session was indeed most interesting and inspiring. An important part of Mr. Featherstone’s schedule was to view key Baha’i properties in Nepal, an assignment he had been asked by the Universal House of Justice to carry out. These included the new National Baha’i Centre that was under construction and the Temple site property. Other activities involved consultation with the National Spiritual Assembly and meetings with believers. I had the pleasure of taking Mr. and Mrs. Featherstone around, and organizing some local activities, a responsibility that was an honor for me. 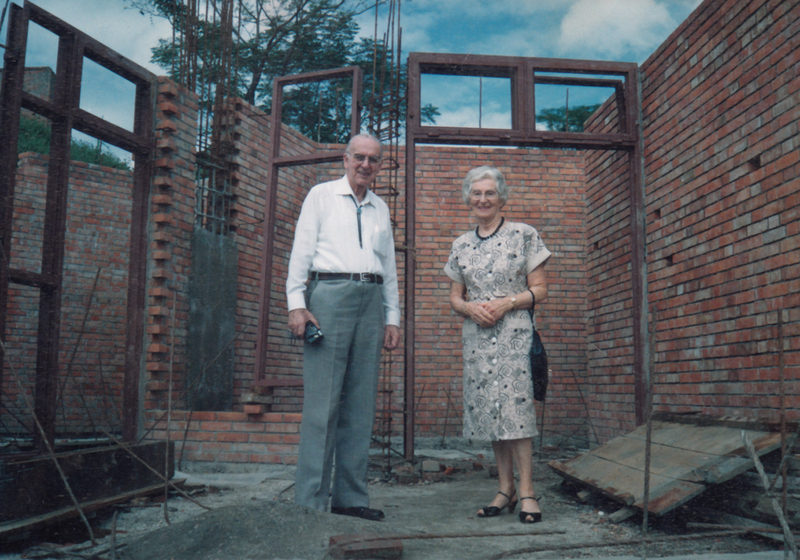 On the morning of 21 September, I met Mr. and Mrs. Featherstone at their hotel and, after a brief conversation, took them to visit the construction site of the National Centre. When I briefed them about the background and status of the construction, they expressed their happiness and wished for its early completion. The Walkers met us at the Centre, and David recalls that Mr. Featherstone praised us for making a water pipe available to the neighbours, saying it was a social/economic development activity! In the afternoon the Featherstones visited the property acquired for a Temple site, which was an approximately four-acre piece of land in Techo, on the Patan side of Kathmandu Valley, with views of the Himalayan Mountains. Mr. Featherstone was impressed with the two major sites he viewed but commented to the Walkers, “You have a bit of a problem with your properties, and that’s access.” Nowhere was that observation more true than for our Baha’i cemetery property, but we did not take him to see that because of the lack of a proper road accessible by motor vehicles. On that evening, a large fireside gathering was held in Elaine Field’s house, which included Australian professionals and other expatriates working in Nepal, and it was well attended. The following day, Monday, I went to the hotel to pick up the Featherstones, and Mrs. Featherstone told me that Mr. Featherstone had been coughing that night. I was shocked and immediately suggested seeing a doctor. I arranged to take them to a doctor, and after the visit to the doctor and taking some medicine, Mr. Featherstone was feeling much better. That was a day of rest for them. On the next day, Tuesday 25 September, the day before their scheduled departure for New Delhi, I met them at the hotel and found them to be feeling better. During their stay Mr. and Mrs. Featherstone had several lunch and dinner engagements with the friends, and on the last day of their visit, they were guests at a lunch in the home of Counselor Bharat Koirala in Patan. Later that night, however, Mr. Featherstone’s health became worse, and in the middle of the night he was rushed to the Tribhuvan University Teaching Hospital in Maharajgunj. National Assembly member Chandra Man Golay had been contacted by the hotel and went to the hospital as soon as he could. In the early morning he then contacted the National Secretary and other members. Mrs. Featherstone moved from the hotel to the home of the Walkers on that Wednesday and contacted her daughter Joan Sinnathamby, who was living in Kuala Lumpur, Malaysia. At the same time Penny Walker notified the Universal House of Justice and the National Spiritual Assembly of Australia about Mr. Featherstone’s hospitalization. Mrs. Featherstone visited Mr. Featherstone later in the day. He had suffered a heart attack and was in intensive care. As a professional nurse, Mrs. Featherstone realized that his condition was serious. 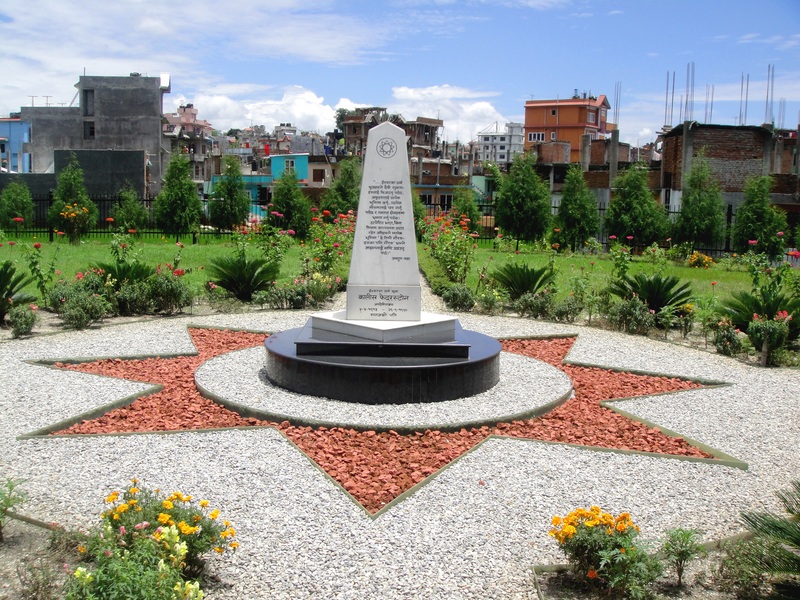 She asked about the Baha’i cemetery in Kathmandu and expressed a desire to visit it. I was free to respond to Mrs. Featherstone’s wish and took her to see the Baha’i cemetery. It was situated in the foothills of a place called Kapan on the outskirts of Kathmandu. A few words need to be mentioned about the Baha’i cemetery. A decade earlier the National Spiritual Assembly had tried to obtain a plot of land for a Baha’i cemetery. This search went on for some time, but without success, mainly due to belief in an ancient tradition that land should not be sold for burial purposes. Then when an elderly Persian believer became seriously ill, the Bahá’ís were desperate to find a plot, and miraculously one was acquired and donated to the Faith by the family of this believer, just in time for his burial. It was to this cemetery that I was taking the wife of the Hand of the Cause. There was no good road link to the cemetery so I parked the car close to a hill and we climbed down its slope. At that time the Mount Kailash English High School was situated there, along with a large uncultivated land that was used as a playground for the school. From the edge of the playground we could view a beautiful landscape of paddy field, with its golden color ready for harvest. It was a stunning view. We proceeded by descending the steep hill on a very narrow path leading to the cemetery. I was worried about the difficult walk, but finally we made it. There was no demarcation of our property as yet because there were no inhabitants nearby; it was a huge vacant piece of land. In the 1980s, two Bahá’ís had been buried in the cemetery and their graves were located on one side. Mrs. Featherstone and I said prayers at the graves and discussed ideas for developing the cemetery. All these events took place during the principal holiday season in Nepal. I was at home making preparations for the Dasain festival when I received the terrible news. Early morning on Saturday, the hospital called the Walkers saying that Mr. Featherstone was seriously ill and that the family should come immediately. In fact, we learned that he had already passed away, but the staff did not want to break the sad news on the telephone. That was Saturday, 29 September 1990. I immediately rushed to the hospital, still in a state of shock. Many things were running in my mind, especially what to do next. When I arrived at the hospital, Chandra Man Golay and David Walker were already there. We discussed the next steps with Mrs. Featherstone and Joan. Mr. Featherstone’s body was placed in the hospital’s morgue until the time of the funeral. Mrs. Featherstone contacted her family members. It was not easy to straightaway book tickets and fly out as computer ticketing or online bookings were not possible in those days. The news of Mr. Featherstone’s passing was spreading rapidly throughout the Baha’i community. Swift action was needed and clear decisions had to be made. All the National Spiritual Assembly members were contacted immediately, and an emergency meeting was held. The National Assembly decided on several immediate actions, beginning with informing the Universal House of Justice, members of the family of Mr. Featherstone, the National Assemblies of Australia and India, as well as the local communities of Nepal. Consultations also focused on plans for organizing the funeral, which was to be held in a most appropriate and dignified manner. Naturally he had to be buried in Nepal according to Baha’i law, and everyone acted on that basis. The family said that Mr. Featherstone always wanted to be buried “with his boots on,” rendering the service that the Guardian had appointed him to carry out as a Hand of the Cause. Penny Walker recalls Mrs. Featherstone mentioning that it was very fitting that Mr. Featherstone had passed away during his travels for the Faith, and in one of the most remote places to which he traveled. Because the timing of the funeral and burial coincided with the Dasain festival, there were no gravediggers available, and the furniture workshop that was to build the coffin was about to close, as were the nurseries where flowers had to be ordered. Nepal, as a Hindu country, had no undertakers, cemetery services, or much experience with burials. Somehow, almost miraculously, the Assembly and the friends managed to make all the necessary arrangements. In order to give time for family members to arrive in Nepal, Mrs. Featherstone decided the funeral would be delayed until Friday, 5 October. Her daughter Mariotte and her husband Leong Ho San in Australia flew from Sydney to Kathmandu on Tuesday 2 October. Together with them was Judy Hassall as the representative of the National Spiritual Assembly of Australia. The Bahá’ís in Kathmandu set to work on the preparations for the funeral and burial. Teams of friends took up different tasks: digging the grave, preparing a passable road, receiving and managing guests, relatives and representatives from members of Baha’i institutions from abroad, and many other logistics. The biggest challenge was probably the road leading to the area of the cemetery. It was muddy, narrow, full of potholes, and completely damaged by the monsoon rain. It went only as far as the ridge above the cemetery; there was no road to the cemetery site. A team of a few friends worked very hard and prayerfully for two full days to try to repair the road, which in the end only could only be used by four-wheeled drive vehicles. Since the Nepalese are generally cremated, there is no practice of digging a grave or a carpenter making a coffin. This had to be sorted out too. Because of the festival, all the Baha’i youth had left for their homes in the villages. Even labourers were not available at that time. Therefore the digging of the grave was done by the Bahá’ís themselves, mainly the institution members. The earth was soft, as though it was a big sand-mine. All the work done on the first day had to be done over on the second day, with the earth always collapsing, making the task difficult and worrisome. Larry Robertson and I were taking the lead in organizing the work. Finally, with all our efforts in applying new techniques–shoring up the collapsing sides of the grave with corrugated roofing sheets and bamboo, and constructing the four sides out of bricks and cement—the grave was ready for the final resting place of Hand of the Cause. David Walker arranged for the coffin with Vishnu Sthapit, the owner of Narayan furniture, near the old Bahá’í Centre. He agreed to build it only if David promised that as soon as it was ready, the coffin would be taken out of his workshop, since the workers would become nervous having a coffin on their premises. The Walkers took the coffin to their house at the end of the day. Gradually other children of Mr. Featherstone started arriving from Australasia—Mariette and her husband Ho-San, Margaret, and Jeff, and Joan’s husband Sinnathamby from Kuala Lumpur. Representatives from Baha’i institutions in Australia, India, and Thailand and other Baha’i guests came, and they were all received by a team of friends and accommodated in hotels. Meanwhile the passing of the revered Hand of the Cause of God Mr. Featherstone was flashed in the media. BBC Nepali Service broadcast brief news on the travels and mission of Mr. Featherstone to Nepal. That was good publicity for the Baha’i Faith. In death, too, Mr. Featherstone was proclaiming the Faith to the public. On the morning of Friday, 5 October, the body of Mr. Featherstone was transferred from the hospital to the Walker residence for the funeral. A befitting funeral service, with prayers and readings suggested by the family members, was held there in a large open room, decorated with floral sprays that were gifts from Continental Boards of Counselors and National Spiritual Assemblies from around the world. Counselor Dr. Perrin Olyai of India attended the funeral, as did representatives from national institutions. Judith Hassall was the representative of the National Spiritual Assembly of Australia, the home country of the Featherstones. Representatives from the National Assemblies of India, Singapore, and Thailand also came for the funeral and burial. Many of the local Nepalese friends from different parts of the country also attended the service. Next was moving the coffin to the burial site. What was previously an unknown and isolated place suddenly became a centre of attraction among those living near the cemetery. At the time David Walker was with UNDP in Kathmandu. He was able to use his UNDP project vehicle, but we needed a second four-wheel drive vehicle. The Australian Ambassador was contacted and told about the passing of Mr. Featherstone, who was the most prominent Baha’i in Australia. The ambassador kindly offered us to use his Embassy Land Rover. When we went to pick up the vehicle, Mrs. Featherstone went along to personally thank the ambassador. The Land Rover provided by the Australian Embassy of Kathmandu carried the coffin and family members to the ridge above the cemetery. From there the Baha’i youth serving as pall bearers carried the coffin along the steep and difficult route down to the cemetery. The high hill overlooking the cemetery was crowded with spectators from the area–children, youth and elderly people. The coffin was carefully and slowly taken to the cemetery and placed on the grave for the offering of final respects. Prayers were offered by the immediate family members, institutional representatives, and friends. After Chandra Man Golay recited the obligatory prayer for the dead in English, the coffin was lowered to its final resting place and covered with earth. Flowers and wreaths were lovingly placed on top by relatives and friends. Many Bahia’s could not control their tears. It was indeed a heart-touching moment, with so much expression of sorrow and sadness. Nepal was witnessing a burial ceremony of a distinguished individual who was born thousands of miles away in a different continent, coming from a different ethnic and cultural background. The Bahá’ís of Nepal accepted him as one of their family members and showed all the love and respect during this burial ceremony. This was an unbelievable sight to the large crowd of onlookers in our midst. They wondered what could be the relationship that had moved us Nepalis to the very core of our hearts. 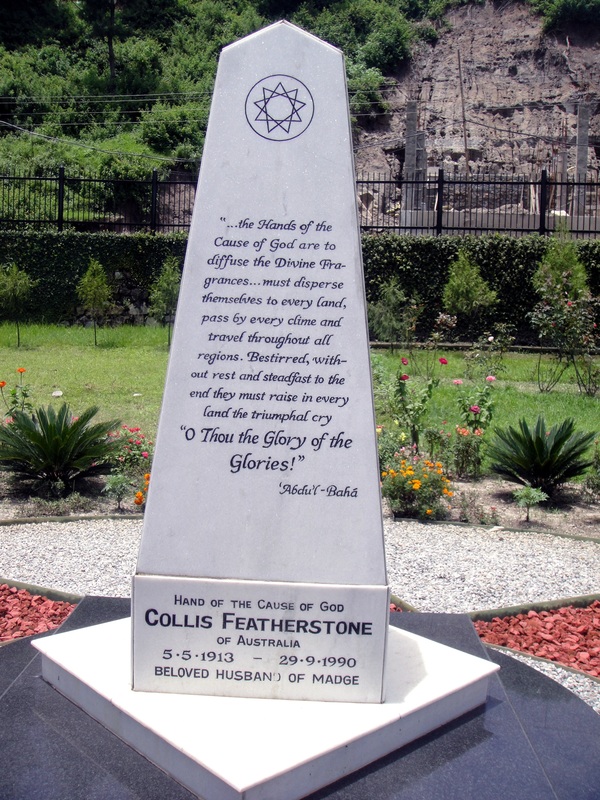 Thus the remains of the revered Hand of the Cause of God Mr. Collis Featherstone came to rest in the foothills of the Himalayas in Kathmandu. Although the passing of the Hand of the Cause was a sad event for us, we considered it an occasion of sorrow and happiness embracing each other–sorrow because a beloved Hand of the Cause had passed away, and happiness because Nepal was privileged to have his body permanently buried in its soil. What a great honor, when viewed in a different perspective. 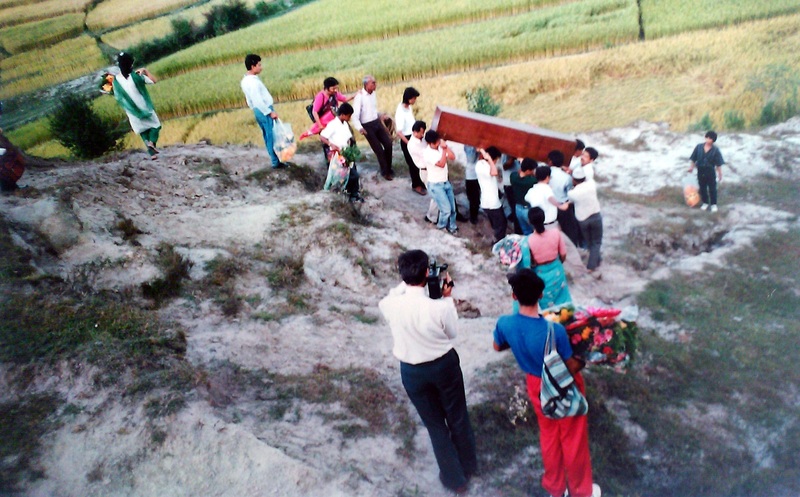 The Baha’i community of Nepal to this day feels proud to have carried out the instructions from the Universal House of Justice, and the wishes of the family members, for the burial of Mr. Featherstone in Nepal. The entire ceremony was carried out in a spiritual atmosphere with great dignity, and with all insurmountable obstacles cleared one by one through the divine assistance of Bahá’u’lláh. The day after the funeral, the official representatives from Australia, India, Malaysia, Singapore, and Thailand departed from Kathmandu with heavy hearts, yet gratified at how the funeral program was carried out. It had been decided that Mr. Featherstone’s grave would be placed in the centre of the cemetery. On our earlier visit to the cemetery, Mrs. Featherstone had pointed to the centre of the land and said to me in a quiet voice: “This is where he could be buried if he is destined to pass away in Nepal.” And, of course, that was the most appropriate place for the Hand of the Cause. The Featherstone family designed the monument, an obelisk on a circular base, and sent the drawing to us, along with a model. The design for the paths and gardens was made by a young Baha’i landscape architect, Sam Kelleher, who had served in the gardens at the Baha’i World Centre. Years later, Nepalese Baha’i landscaper, Kiran Shahi, worked on the beautification of the cemetery. At present, we have a lovely cemetery garden, surrounded by a strong wall built with assistance from the National Spiritual Assembly of Australia, and now accessible by a proper road. Later, adjacent land was acquired, and a building added for a caretaker. Sometimes neighbours are invited to informal programs held in the cemetery compound. In the centre of the cemetery is located Mr. Featherstone’s gravestone with the marble obelisk. Engraved on it is a beautiful quotation from the Baha’i Writings. Thousands of people pass by this cemetery and his monument, which is now a silent teacher of the Faith. 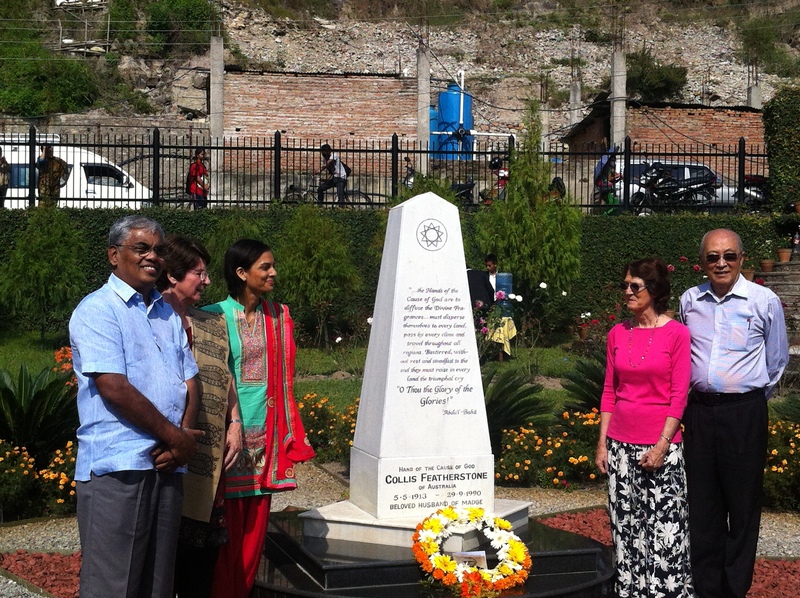 Beautified resting place of the much revered Hand of the Cause, visited by family members. I accepted the Faith in 1978 through Raymond Peter of Malaysia while I was on a United Nations training fellowship in Plymouth, UK. At that time I never expected that Bahá’u’lláh would bestow on me this great blessing of attending to the burial of a Hand of the Cause of God. Since accepting the Faith, I have served in many capacities. Yet what I consider the most rewarding of all services was to have served the revered Hand of the Cause Mr. Featherstone in his last days, culminating in helping to arrange his burial. It was indeed a rare privilege I shall never forget! It is to Bahá’u’lláh that I am eternally grateful for this bounty.